2020 H-D response to the Indian FTR1200? View Poll Results: How will the MoCo respond to the Indian FTR1200? I have to agree Bone, but Indian sales have nowhere to go buy up, they are still a growing mark. Even in the declining market Indian sales are up. and single digits up sure beats double digits down. Yes potato potato is going sell, but how much longer, HD decline in sales is huge. The reason is because HD is depending on potato potato and lifestyle, Indian is making inroads because they are offering an alternative that performs. Seen the flat track results for the last few years? Remember the VR1000 race project? then they said they were going release that engine in a bike. There were guys drooling like a pitbull waiting for that, but instead they take the engine and make it look like a traditional V twin and release it in a long low cruiser style package. And they wonder why it never sold well. Do the same old thing and get the same old results. The world is a stage and HDs reputation is center on it right now. They have to respond or admit that they only do what a passing generation wants them too. How big does a company want/need to be is always a question. I mean for decades BMW sold what 50-100k bikes per year. Triumph came back in the 90s and they just hit 64k bikes last year. Even at ~240k bikes last year Harley did better than EVERY YEAR THEY'VE EVER BEEN IN BUSINESS BEFORE 2002. Remember in 1986 Harley only sold 36,735 bikes and even 2001 was only 234k. As a whole the market is still declining. Yes we're seeing a shift of some units from some players like Harley to others. Yes Indian will continue to erode some of that away if Harley doesn't respond but their not about to close their doors anytime soon. Besides, you can't compare % increase and decline between two companies whose sales are so disparate. So in 2014 Suzuki and Polaris were SHARING 5% of the market, that's 2.5% a piece. It takes VERY little additional sales at that point to see single digit growth, and not all that much more to see double-digit. And in the meantime Harley has debuted a fantastic M8 motor and the most thorough revision of the middle of their line (Softails) in years. I'm hearing more and more metric riders who have given the new Softails a whirl compliment Harley on the overall performance (not just fit, finish, feel, but performance, throttle response, braking, handling). Now yeah, IF they want to grow again or just remain competitive they can't rest on their laurels. With the Softails and Touring bikes in a good place right now competitively I think we'll see some attention to the Sportster line soon, and yes, perhaps an expansion of the XG line. So I do think they'll respond. But I don't necessarily think the sky is falling the way some seem to think it is. HD had everything they needed in a high performance V Twin, it was called the Buell 1125, it compared well with a Duc Panigale 1199 for heavens sake, HD decided to kill it. What a mistake! Harley has relied for a long time on their 'Stage' upgrades. or to hang with what others are doing. If they come out with a straight performance bike - where to go from there? because people have become so accustomed to it and it's expected from them. People who just wanted a bike for performance have always had a lot of other options. but I think a lot of people who are into straight up performance will still look elsewhere. true, but remember the Scout can already run circles around a 1200cc Sportster. They are already losing sales to those who want an American V twin in a more sports package than the big twin. there is a saying, if you want the same old results, keep doing the same old thing. Harley really needs to embrace that right now, the kids buying motorcycles are not buying into the lifestyle, they want more. I agree and feel we have to wait and see what comes out in the next year or two. It will be interesting if they release something this summer or wait until they make the move to KC in 2019. In the early 80's H-D nearly went out of business. 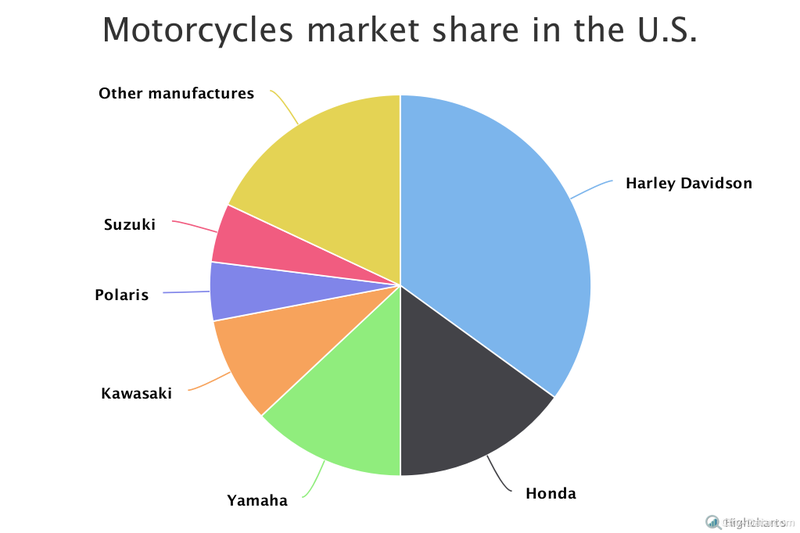 Now, they sell more motorcycles in the US than anybody else. They should keep on doing the same old thing. Bone I see your point, I just feel that the decline in sales for the moco is not proportional to the industry. As noted Indian sales are increasing as is Triumphs. There is growth in brands that are answering the wants of those posed to buy. I hate to use the term but millennials are the market to capture and that market does not view motorcycles as we did when we were that age. Hell, I am 60 years old Sunday and I consider Harley the biggest MINIVAN dealer in the world. Most modern HD riders want baggers so they can bring along everything and be protected from the wind. What ever happened to freedom, open road and wind in the face? I work with younger riders, it is the nature of having a career in construction, most want smaller bikes, the scrambler market is huge right now, as is the hooligan market, 2 markets HD does not participate in. I would say Indian does not either except the Scout and the proposed Dirt Tracker inspired Scout tells me I am wrong. I really hope HD responds, But in the end that is the MoCos managements decision as to where they want to be in the marketplace. I see they are trying to expand in foreign markets. Maybe the next salvo they fire is going be in that direction. Crusty, in the Early 80s they changed dramatically to achieve that goal. and now their market share is shrinking, it is time to figure out why and stop blaming a down turn in the entire industry. Accepting a industry downturn is one thing, but denying that your share within that downturn is shrinking because your product line does not meet the desires of the public is another. I agree, but the younger rider of today, who wants a bike does not value having to dump money into a bike to get it to where they want. Millennials have grown up in a society where instant means just that. want an answer, google it, want a book, download the kindle to your player, want news, stream it in, want attention, post up on social media. Want a performance bike 1200cc v twin, buy a Scout. Because the Sporster will require over a grand just to get to stage one that is just the start to getting where a Scout is. I agree with you whole heartedly the options are elsewhere and the market is turning to that elsewhere. because lifestyle is not selling to millennials. The sky is not falling yet. Me personally, I think the Harley management are not bikers at heart. Its oblivious they do not want to build an all out race bike to compete in flat track. If they start building performance bikes it will surprise me. In the mean time we have Hammer performance to see us through. I started riding Harleys in 1960. I love them.